My 6 year old boy (that says a lot right there, doesn't it?) does not like anything that looks like actual school work. I try to keep lessons short and fun, but at the end of the day, he still has to hold his pencil properly and do his best to write his letters, you know? This child in particular responds really well to technology-based learning, and while that doesn't thrill me sometimes, there are a lot of great apps out there. 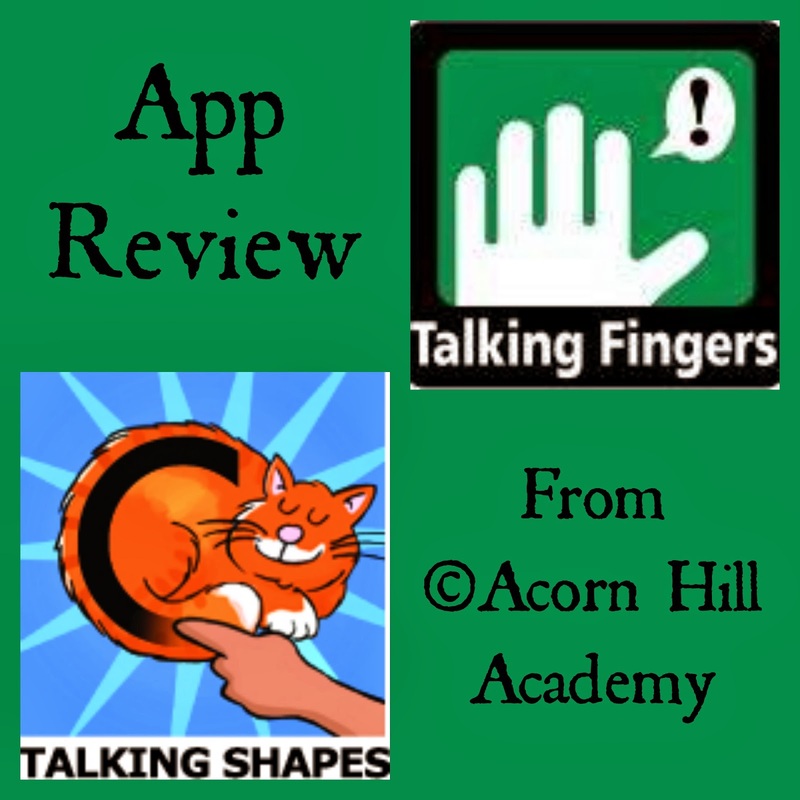 One of them is the Talking Shapes iPad app from Talking Fingers, Inc. I received a copy of the app for free so I could review it for you. It's intended for preschool to kindergarten aged children. 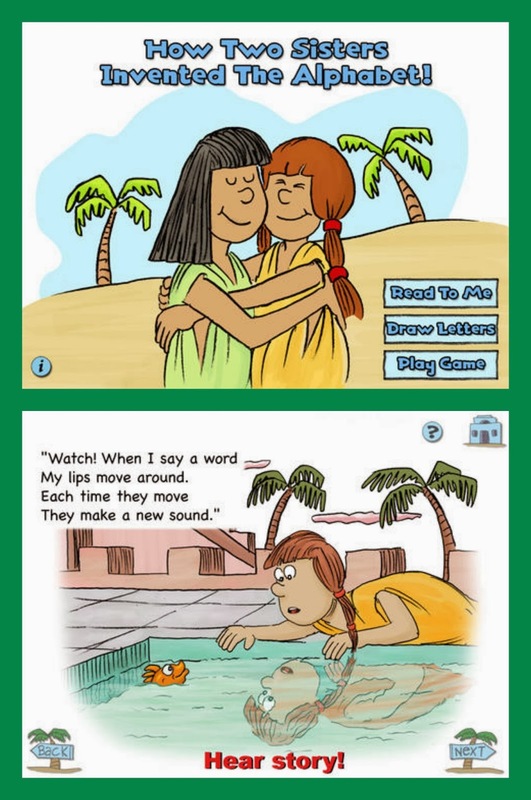 The app starts out with a story about two girls and how they invented the alphabet. 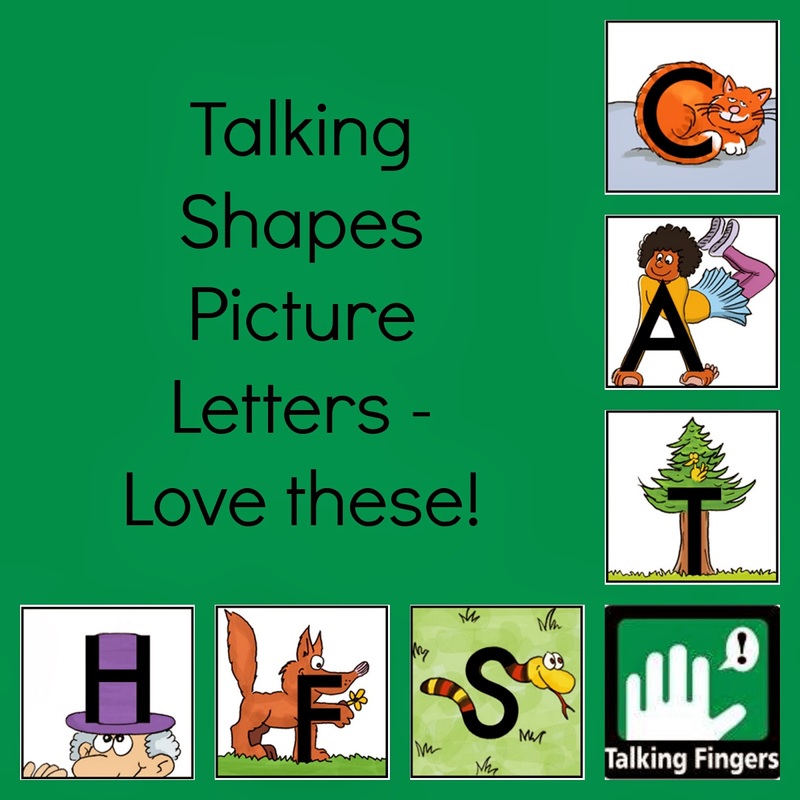 They come up with pictures for the letters, and as they introduce each letter, the child has to trace the letters with their finger. Aren't they cute? I love the concept of associating a letter with a picture. As they learn the letters and corresponding pictures, the child is asked to say the word describing the picture - for example, INCHWORM, which goes with "I." Then, when they practice drawing "I," they can tap on the picture of the inchworm and hear themselves saying the word. We had a little trouble getting my iPad to hear us say the words, but I think that's because my case covers up the microphone somehow. When you open the app, there are three options on the main screen: "Read to Me," which allows you to choose which story you'd like to hear; "Draw Letters," in which you choose which of the three stories you'd like to practice tracing the letters; and "Play Game," which, naturally, takes you to the game for the book you select. to squares to spell words. Then, the little story is shown, and the words that teach the phonemes for that book are highlighted, one at a time, in red, then removed from the picture. Balloons, chickens with flapping wings, and flying pigs (depending on the story) move across the screen with different words in them, all from the story, and the child has to read the words and choose the correct one to fill in the blank. I will say that I found the chickens distracting. Their shapes were a little too small and the flapping wings made it hard to read the words. Isaac didn't seem to mind, though. Once the game has been completed, a fun little scene plays at the bottom of the screen. Isaac loved those and would replay them over and over just to laugh at them. The only drawback I found was that when drawing the letters, Isaac figured out quickly that all he had to do was scribble with his finger until the letter outlines were filled in. The app didn't require him to trace the letters. Once I saw that, I made sure to have him trace the letters properly. I would love to see the app require actual tracing. This app is certainly not our only source for handwriting practice, but it does seem like a child would get more out of writing the letter with their finger. Isaac loves this app. We used it most days, and he was willing to spend a few minutes to go through one part each day - on the first day we'd do the story, the next day we'd work on drawing letters, then finally playing the games. I have seen significant improvement in his ability to put letters together to form words since we started working with it. He enjoyed it, too. Even while I was looking through the app as I wrote my review, he came over to see what I was doing and play with me. It's a nice addition to any reading program, and provides interactive learning with a fun way for a child to practice letter sounds and word building. The app is available from the iTunes store for $5.99. Connect with Talking Fingers on Facebook, Twitter and YouTube! We just got an iPad so thank you for your honest review!